Tribhuvan University, the Controller of Examination Balkhu published the results of MBS 2nd year. The exam was held on 2074 Chaitra. There are many options to check MBS 2nd Year Results. 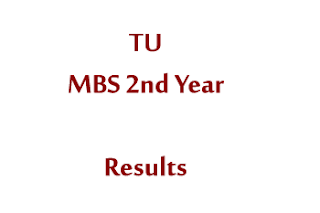 To check MBS 2nd Year Results Tribhuvan University follow the following methods. Click on this link to check result from edusanjal. Click on this link to check result from NTC. Dial 1602 from NTC and follow the instruction to check result. You can follow one of the above methods to check your result. Best of Luck.